Looking down from Fat Cookie land. Getting too much publicity for your out of home business venture can be a bad thing. Just ask the folks at Fat Cookies, who were shut down this week by the fuzz. Their idea was simple enough but unfortunately not legal. 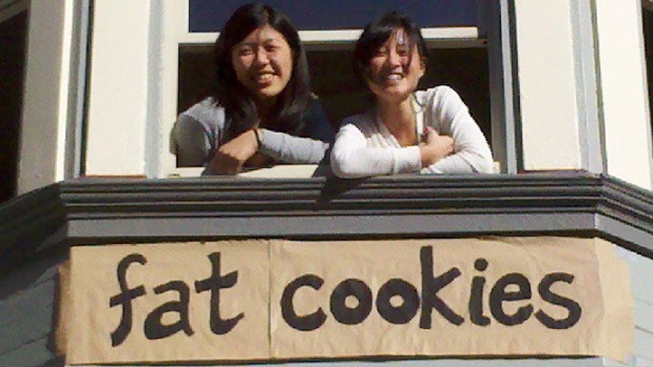 A group of San Francisco friends decided to hang a note outside their window on a string: "$1 for a FRESH BAKED COOKIE!!" If you were interested in eating a warm cookie, all you needed to do was hang a dollar bill on the attached clip and pull the dangling string. Soon a cookie would be headed your way. The novelty of the idea was picked up by Laughingsquid, who in turn tipped off the Daily What and boingboing. But SFoodie reports that the blogosphere was not the only place that the scent of the cookies were picked up. The San Francisco Police Department was tipped off that some non-permitting baking and selling was going on. Officers visited the three friends and forced them to shut the operations down unless they could secure a permit. But Fat Cookies was not shut down before it could build up a loyal following that includes fans from Germany and England. The entrepreneurs say they will be back in some form. Keep up with them on Facebook.